If you follow me on twitter, goodreads, facebook, or have checked out my “events” tab in the last month, you probably know I went to Ft Hood, TX for a book signing (Or, to be more accurate, I went to Texas for my sister’s wedding and scheduled a book signing around the same time. Congrats Melissa and Craig!). Well, for a self-published author, this was a big week. Knowing it would be a 3-day signing event, but not knowing what to expect, I ordered 3 boxes of books (24 each) and brought the 10 I had sitting at home, just because I was feeling optimistic. So, with 82 books, I was hoping I wouldn’t have to leave too many at my parents’ house. First stop was to our hometown newspaper, where I was interviewed. I’m still new enough to the game where little things like this are novel and exciting. If you like, you can read the article here. Next stop? I’d heard that Hastings has a “local author” section, so I decided to give it a try and see if I could leave a few copies there. Much to my surprise, not only was I accepted at Hastings in Killeen, but I was placed on the “zombie” shelf right up front as well as out in the general “horror” section. Whoa! That in itself was a huge life event–my first brick-and-mortar store. Saturday, day 2: Thanks so much to my sisters–love you guys! The book sold like hotcakes. There was often a queue at my signing table, zombie fans eager for a book and a photograph with our crazy family. I sold 47 books. I had to tell my family members not to buy any for themselves, otherwise I’d be in danger of selling out. I had already dropped off 9 at Hastings, so I was left with only 5 left for Sunday… gulp. Don’t worry, my family scares me too. Sunday, day 3: I sold out in about an hour. Boy, did I underestimate. I should’ve brought two more boxes at least. I think I could’ve hit Friday’s numbers at least, then I would’ve had some left over for Hastings after I left. Instead, I had to direct disappointed would-be customers to either this store or amazon.com. After checking with Hastings, turns out they sold out of my book as well–making it their #1 book for the week. Even beating out “50 Shades of Grey”! Granted, E.L. James wasn’t in Killeen promoting like I was, but it still felt like victory. This was an appreciated confidence booster, and it was fun to be a minor celebrity for a weekend, but I still have lots of work to do before “Click Your Poison” is a household name. So what’s next? Of course there’s book #2 to work on, but I’ve also been invited to come back to Fort Hood any time, and I probably will. Maybe for book #2? Maybe around Halloween when the zombie craze is at its peak? 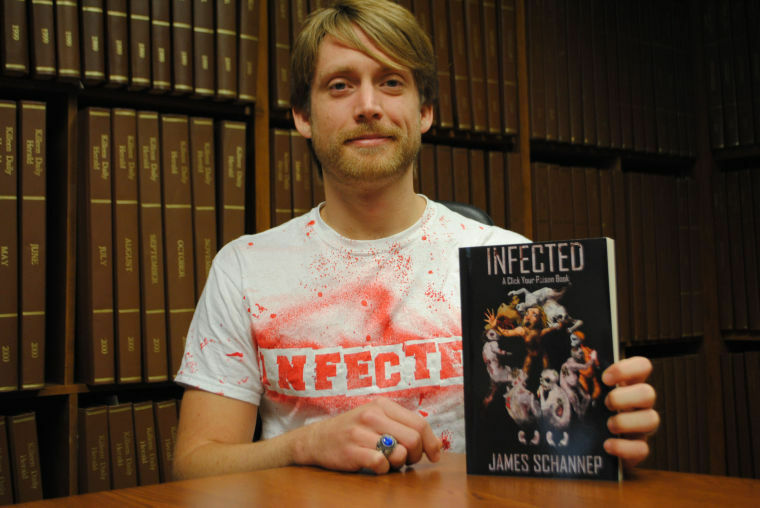 In the meantime, I need to ship more books to Hastings and see about getting other stores out there to carry INFECTED. Maybe there’s a Big Week in California in my future? Who knows–but wherever life takes me, the future looks bright.